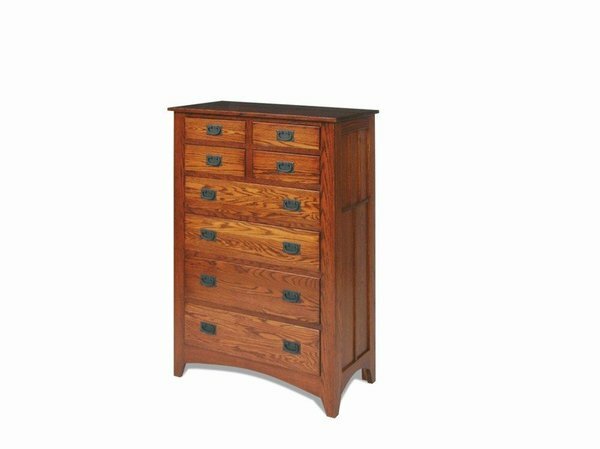 Our Amish Craftsman Mission Chest of Drawers is handcrafted from 100% solid hardwood construction with a mission style design. This Amish Furniture, solid wood Craftsman Mission Chest of Drawers is well designed and stylish with clean lines, carved panel sides and drawers that show off the solid wood grain. Customers have the choice of black or wood Mission hardware. The drawers are dovetailed for years of everyday use in this Amish Chest of Drawers. There is plenty of storage in this Mission Chest of Drawers and it ships assembled! This solid wood furniture is made in the USA, get yours today in the hardwood and finish of your choice! Thanks to you, Linse and especially the hardworking guys in the shop for your efforts. Cheryl and I are couldn't be happier with the furniture; it is absolutely perfect. Just as important was the pleasure dealing with everyone. Gary and Andy made our day with their timely, professional and cheerful delivery and placement of the furniture. Please pass on our thanks all involved and Happy Thanksgiving to all!